Our trip among Italian regional dishes is going on and today we are moving from Rome to Tuscany to eat something very typical in this region: Pappa al pomodoro. Probably this Italian regional dish comes from Siena, but nowadays families cook it at their home in quite all Tuscany. Everyone has its own recipe and you can taste several different Pappa al pomodoro travelling through the region. For centuries local food was considered the food of the poor. The rich were used to eat what they could import from abroad and they weren’t connected with the seasonality of farm products. It is the case of Pappa al pomodoro and many other regional dishes. Nowadays the Tuscan bread soup is no more considered as poor, but healthy. If you are looking for the original recipe scroll down and subscribe to our newsletter to download it. 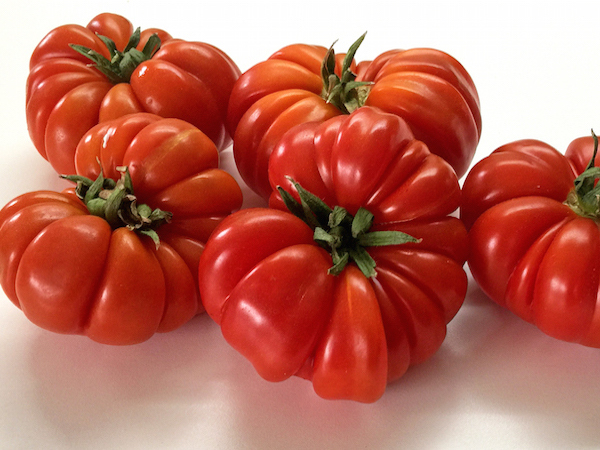 If you are curious to know more about Pappa al pomodoro, continue to read. Many years ago when I was at the infant school, my teacher used to sing a song while my class was going to the school canteen. It is a very popular song in Italy and everybody knows it. Listen to the song playing the video here below. She is Rita Pavone, a famous Italian singer. She interpreted Gian Burrasca, a character created by the Tuscan writer Vamba for the book “Il giornalino di Gian Barrusca” published in 1911. Since I was a child, I always thought that pappa al pomodoro referred to the pasta with tomato sauce. Because ‘pappa‘ is a word used by the children to call all kind of food. This until I was in Florence for an event 5 years ago and there was a strange mush on the buffet. I asked to the waiter what that was. He answered me: “Pappa al pomodoro“. Would you think of my face when I realised I had been being wrong for more than 20 years? ‘Pappa‘ has another meaning. The word indicates soaked food. In fact the ingredients are soaked with tomato sauce. The ingredients of Pappa al pomodoro are very poor. The dish was born among peasants who had to struggle with poverty sometimes. That’s why they didn’t used to throw away food trying to reuse it in other different ways. For example the stale bread, that is the main ingredient of the Pappa al pomodoro recipe. They had not to waste the bread and everywhere in Italy there are recipes to reuse it. The bread has to be exactly the Tuscan one because it is without salt. 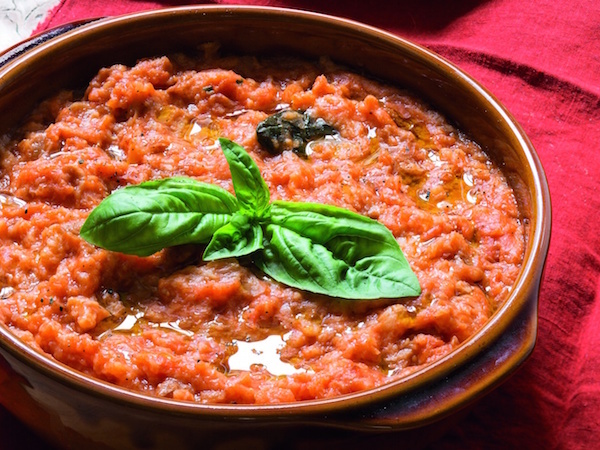 The ribbed tomatoes are the perfect quality to prepare the tomato sauce for the Tuscan Bread Soup. Another important ingredient is tomatoes. We already knew that they were imported in Europe after the discovery of America, but Italians started to eat them many years later. That’s why Pappa al pomodoro recipe was recently rather than other recipes, like Piadina romagnola. You have to remember absolutely to not add cheese neither grated nor in pieces. Every single area has its own recipe. You can use onion and garlic minced or broth. This Italian regional dish is versatile. You can eat it during summer or winter and also the children will like it.